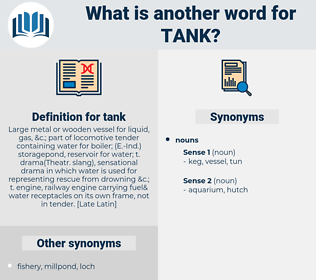 What is another word for tank? cisternae, drains, dive, basin, barrel, capsule, bucket, vessel, Prover. 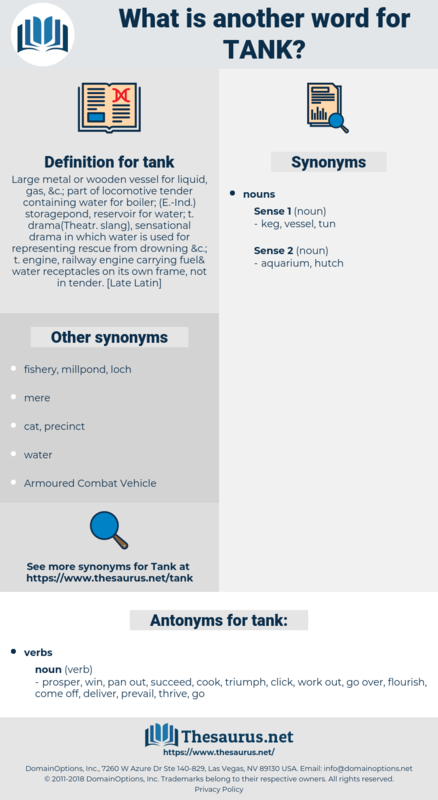 cistern, reservoir, chariot, aquarium, Aquaria, beaker, cylinder, impoundment, caisson, storehouse, sink, canister, receptacle, container, stockroom, pond. prosper, win, pan out, succeed, cook, triumph, click, work out, go over, flourish, come off, deliver, prevail, thrive, go. The train was late, the guard at the tank said, and in consequence the ranger was torn between an agony of impatience and a dread of parting. Of course, if there were but little water in the tank it might take a long time to get enough for the ponies. booze, fuddle, hit the bottle, drink.